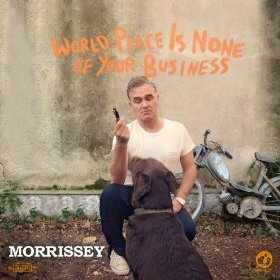 It looks like Morrissey might be in some hot water over comments he made regarding his recent run-in with police in Rome. Last week Morrissey was pulled over by police after the car he was riding in was allegedly going the wrong way (it's still unclear whether Moz himself was driving). Things escalated from there after the officer allegedly asked to see his papers (documentation/passport/etc). After a 35 minute altercation the police let him go, leaving Moz to fume over the entire situation. Photographer Sam Esty Rayner* (aka Moz's nephew) later posted about the drama on his Facebook page. The post included a photo of the officer along with a quote or two from Morrissey alleging he had been "terrorized" by police. For their part, the police allege Moz was speeding the wrong way down the road and claim he had an attitude from the beginning because the officer didn't recognize him. After the story went viral, U.K. newspaper The Metro contacted Morrissey to confirm the events in Rome, and they later published a piece featuring several colorful comments from Moz, who referred to the police department as "armed psychopaths." According to new reports published today (translated here), Roma police weren't amused by his "armed psychopath" comments and the department is now threatening to sue for defamation. It should be noted that after settling his libel lawsuit with NME in 2012, Morrissey has mostly refused to do interviews unless they are emailed (to protect himself from being quoted out of context). It is unclear whether his interview with the Metro was via email or recorded. Read Morrissey's quotes that appeared in The Metro below and check out the whole piece here. "Yes, I had an attitude – of someone being provoked. I do not expect anyone anywhere to know who I am. If this is all the police can say in their defence, then you must draw your own conclusions. "If this can happen to me on a busy, daylight street in Roma, then Italy places itself right up there with Syria in terms of moral stability. "With armed psychopaths free on the streets of Roma, then incoming migrants will soon be storming Italian borders to get back to Libya. "Italy’s ranking as 126th most dangerous country in the world has now shifted to number 1." Morrissey hasn't posted a statement or account of events on his official Facebook page or True To You, but stay tuned. *To make matters more interesting/convoluted, Rayner is now claiming he wasn't even in Rome when the altercation took place.